Invite your friends – bring your families for this Family Friendly Event to introduce the Community to Bill Ostrander who is running for the CA Assembly District 35. Lompoc is the kick-off event for similar events up the coast to Paso Robles. If you haven’t heard him speak, you will be glad you came and now know what his priorities are for our area. This is not the tried and true political event – Bill Ostrander will wake you up! If you have heard him, you know this is important and please reach out and bring some folks who don’t know him. Please forward to friends, neighbors, and family. 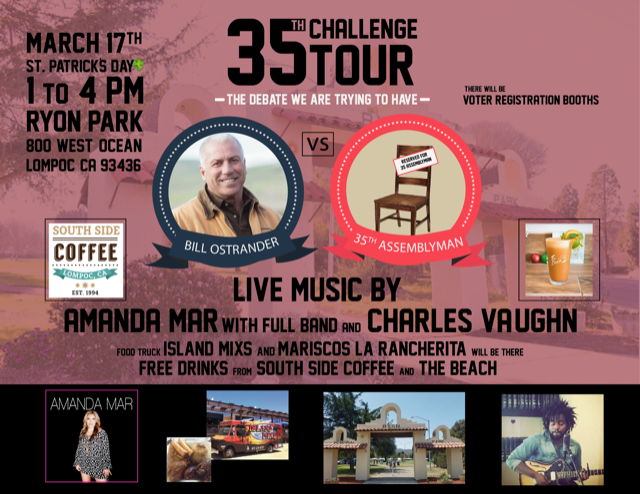 There will be music, food trucks, free drinks from Southside Coffee and The Beach Restaurant and Bill will speak or debate depending if the current Assemblyman attends. If you belong to a community group, community agency, or business and would like to have a table to share information, let us know. I will send your interest to the organizers of the event. We will have a table for Voter Registration also.